Before I get too far (well, before I get anywhere at all), let me just tell you all how HORRIBLE I feel about not blogging in like, FOREVER. It’s not that I’m wracked with guilt (except that I am), but I just enjoy blogging, and I miss it. What can I say? I’m a writer. Alas, time is not my friend these days… I honestly don’t know how Kath does it…three times a day! I know her posts aren’t long or eloquent, but it still takes time to take, download and upload photos, in addition to writing a snippet here and there. I find myself saying, “I don’t have time for (fill in the blank), and I don’t even have kids yet!” Seriously, how does one fit them in?!?! I suppose children are just like any other top-priority item; you just do. All that to say, I’m sorry I haven’t blogged in awhile. No, I haven’t dropped off the face of the earth (although it sometimes feels like I have) and yes, it’s good to be back. And, as usual, I have lots to say! -Check out my Maple Syrup post for the co-op. The maple-bacon cupcakes (muffins if you want to sound “healthier”) are the perfect brunch item and will send the eyeballs of everyone to whom you serve them rolling into the backs of their skulls. Make them this weekend! -We went to Ohio this weekend to visit our friends, Emily and Dan, and Dave and Jen, and their new baby, Aiden. I also got to see Susy, another dear friend and running-mate. We had a fabulous time, although I didn’t take enough pictures (I never do). I’ll be posting about our trip soon. -I’m officially on “Easter Break” right now. Except that I still get up at 0-dark-30 to drink coffee/eat breakfast/workout. And I have school work to finish. In fact, I’m going to the chem tutor this morning. Oh, and I have tests in all my classes when I get back next week. Not to mention the mile-long list I’ve made of stuff to bake. So, really, I’m not taking a break at all–I just don’t have to go to class. 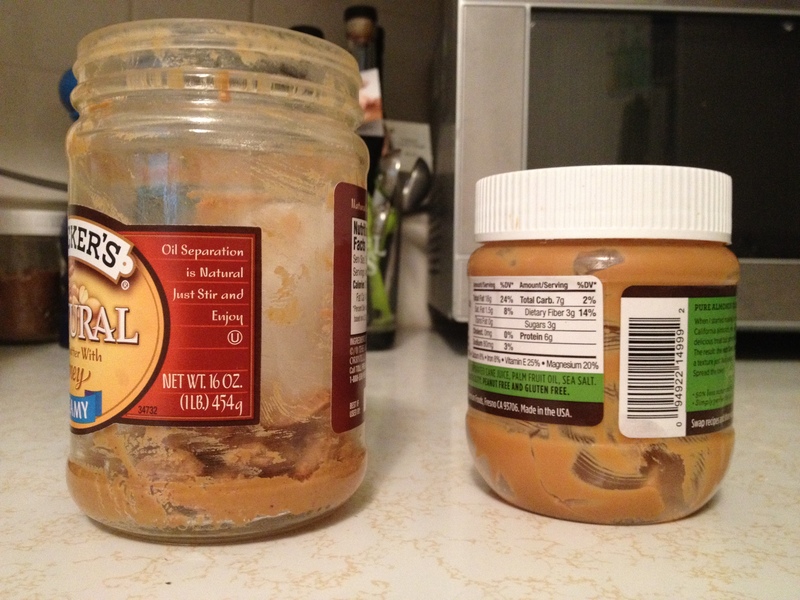 -A miraculous thing happened the other day: I finished off not one, but TWO jars of nut butters! If you don’t know already, this means I get to enjoy a rare treat TWICE–OIAJ! -I made oats in the Smucker’s jar (left) yesterday for lunch: oats, flaxseed meal, chia seeds, flax seeds, a splash of strawberry kefir, dehydrated strawberries, cottage cheese and granola on top. (Thanks for the granola, Susy!) Of course, all that with a little peanut butter swirled in. This baby filled me up for hours! Yay for having another one (Crunchy Barney Butter) in the fridge. -Andrew and I fasted last night while praying for some friends who are going through a rough time. I’ve never fasted before. I’ll be honest, food is kind of a big thing for me (as I’m learning through the Made to Crave Bible study–more on that later–I’m doing with Emily), so when Andrew first proposed the fasting idea last week, I was pretty against it. But, God totally changed my heart and by yesterday morning I was pumped and ready to go! I had my last snack at about 4:45 (we haven’t been eating until 7:30, so snacking at that time is normal for me) and we prayed together in two sessions. God totally provided (I thought I would be in agony; my tummy was growling, but I–obviously–made it through) and not only was it a great time of prayer and bonding with Andrew, but it also helped get me off my sugar-kick from this weekend and take one step further in my journey of leaving my food issues behind me. 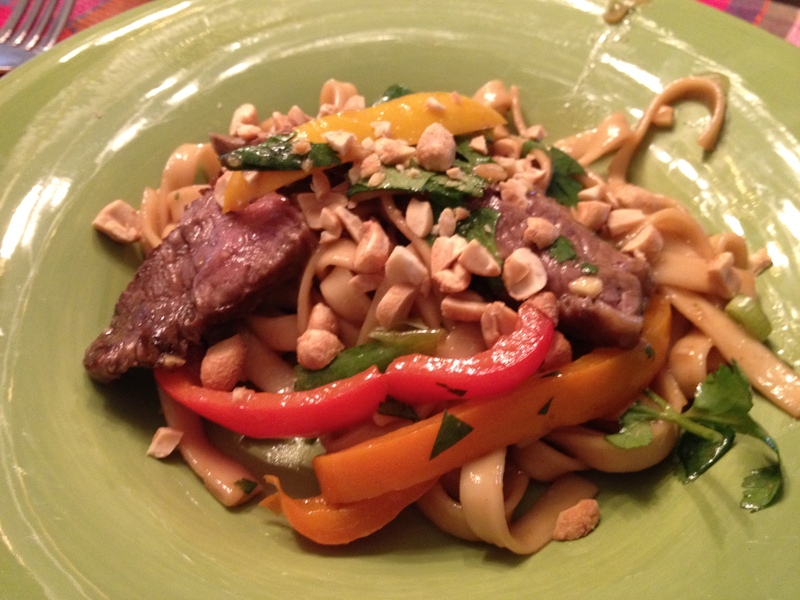 -Speaking of food: I made Pioneer Woman’s Simple Sesame Noodle salad with Beef the other night and it was wonderful! This is something I saw on her blog ages ago and is included in her new cookbook. Andrew also really liked it, but I thought it was way too oily, so I’ll be reducing that next time. I added the beef to make it more of a meal (it’s a variation in her cookbook, not sure if it’s in the online recipe) and bell peppers for more color and nutrition. 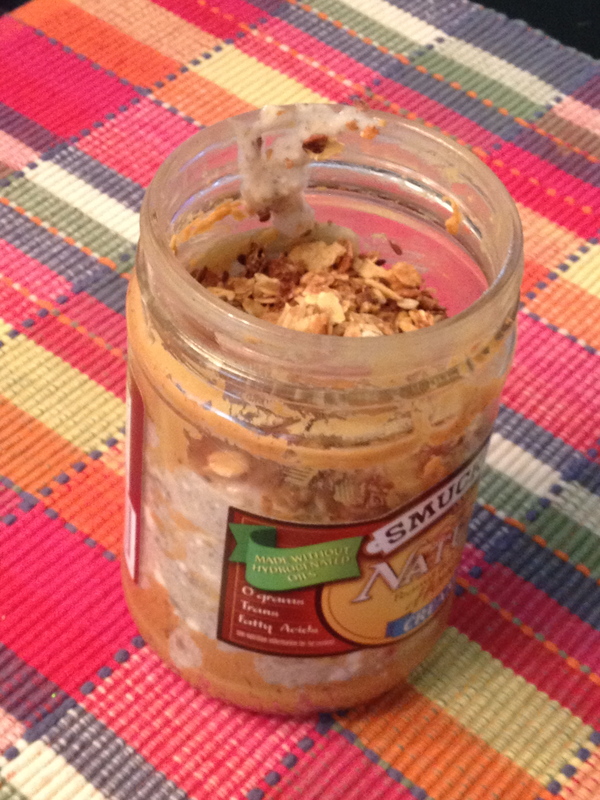 Topped with chopped peanuts–yum! -I’ve come to the (sad) conclusion that I need a cup of coffee to get me through my T/Th Statistics class (1-3 p.m. yikes!) without my eyes uncontrollably closing on me. Guess that’s what happens with a 5 a.m. wake-up time and swim practice. I’ve done recent “taste tests” and I’m not a huge fan of Tim Horton’s (unfortunate since they are EVERYWHERE around here) or the cute little local place here in the Orchard Park village, Orchard Perk, (although they may have more than one roast…). I’d make some at home, but at the moment have no good coffee thermos with which to actually transport the coffee. To-do for this weekend: find one! -Easter is this weekend and Andrew’s grandma is coming for a visit! SO EXCITED! I’m running in the Bunny Hop 5K, which goes right by their house (neat! I might have a cheering section), and I’m hoping to spend as much time with everyone this weekend as possible = get as much work done as possible before Friday night, and what in the world do we do with Hadrian?? -Did I tell you all I’ve officially gotten into the Dietetics Program at Buffalo State? Well, I have. I have one summer class before I start full-time in the fall. I’m a little anxious about scheduling my fall classes since I schedule last (as a new transfer student) and the classes I need are small with only 1 or 2 sections. I think the professors will provide an ‘override’ if I can’t get into something I must have, but I’m still nervous. -I’m making steakhouse mac and cheese today from Cooking Light. CAN. NOT. WAIT. Whew! I think that’s about it… Or at least a good start getting caught-up!